Our heat pumps use renewable energy to heat a home and provide domestic hot water. It is an energy efficient alternative to traditional heating methods; the unit extracts ambient air from outside a home and transforms this in an electrically powered heat exchanger to achieve an energy output of up to five times that of the energy input (The 'COP' - Coefficient of Performance). In addition to delivering a very low cost heating and hot water solution, the units have minimal carbon emissions of just 50% of traditional boilers and 30% of electric heating methods due to the use of free renewable energy. The units are easily installed, have low maintenance requirements, are kind to the enivronment and have a 20 year life expectancy. 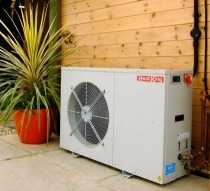 Air source heat pumps can be linked to thermal solar, PV solar, or both. To find out more about the energy savings you could make, Call us on 01296 711 405, or email info@raceenergy.com.